History abounds in Maryland and most of us forget to notice it. Whether you are walking the cobblestone streets of Annapolis or driving by a historic navy vessel in Baltimore, it is easy to forget the rich history that surrounds you. By doing so, you could just miss out on some amazing educational adventures of your own. Here are the 14 best historical sites in the state. 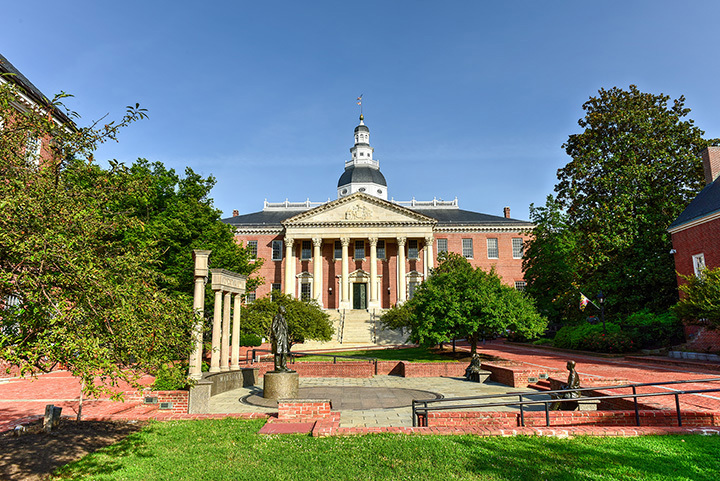 This former capital of the United States is full of historic character and the Maryland State House is where the Continental Congress ended the Revolutionary War by signing the Treaty of Paris. This is also where George Washington relinquished his post as the Continental Army Commander in Chief. Still in use today, you can have a tour or watch lawmakers in session. The USS Constellation has been beautifully restored and cared for. It is the last all-sailing ship in the American Naval Fleet and played an important role in the fight against slavery as the Navy’s flagship in Africa. If you or your kids love boats, walking the decks of this historic naval vessel will leave you dreaming of the open waters. No trip to Maryland would be complete without visiting a historic battlefield. Antietam Battle Field is the site of the bloodiest day of fighting in all American history—September 17, 1862. Head to the visitor’s center for more information on this historic day and the men who fought and died here. While on a ship off Fort McHenry, Francis Scott Key wrote the Star-Spangled Banner. Today, you can visit this historic fort, watch reenactments, walk the grounds and imagine what it would be like to have been watching the English lay siege to Baltimore, hoping to catch a glimpse of our nation’s flag. Few realize that the heroic story of Harriet Tubman began in rural Maryland. It was at Bucktown Village Store that she first stood up for another slave and received a beating for it. This experience only furthered her resolve to help herself and other slaves become free. Harriet Tubman’s story and her underground railroad were nothing short of miraculous and here you can see where it all began. The first capital of Maryland, St. Mary’s City has been beautifully preserved and historians work every day to recreate life in the 1600s. You can see them walking the streets in period clothing, maintaining an old plantation, and working on the docks of the Dove. Anyone who loves history will enjoy an afternoon in St. Mary’s City. It seems hard to believe but Maryland was once at the edge of the frontier and Fort Frederick proudly served as protection for Western-headed settlers while also playing an important role in the French and Indian War, Revolutionary and Civil War. This restored fort hosts tourists and locals alike looking to become part of its illustrious history. Even if you are not one to ever visit a gravesite, you should not miss a trip to the U.S. Naval Academy and John Paul Jones’ Crypt. Hailed as the father of the U.S. Navy, this unique and beautiful historic site makes you think of pirate movies and what it would have been like to be part of one of the greatest navies in the world long ago. This brilliant freedom fighter, author and revolutionary had his summer home outside of Annapolis in Highland Beach. Lovingly restored, it now serves as a museum for anyone interested in glimpsing what his life must have been like as he unknowingly shaped part of America’s future. Interesting fact—Highland Beach was formed after Bay Ridge Resort, five minutes down the road, turned away Frederick Douglass’ son Charles. He and his wife then purchased this 40-acre tract of land with beachfront and it became far more significant historically than Bay Ridge by hosting residents and guests that include W.E.B. DuBois, Langston Hughes, Alex Haley, Booker T. Washington, and more. Annie get your gun! America’s sweetheart turned sharp-shooter, Annie Oakley, bought this Cambridge home with her husband Frank as their retirement home. It didn’t work because anyone shooting and performing since the age of eight would find it difficult to settle down in this sleepy little town. After four years, they went back on the road, but this charming home is a museum full of Annie’s favorite things. George Washington’s army relied on the Catoctin Furnace to create arms for the Revolutionary War. In 1774, Thomas Johnson and his brothers built the furnace as a place to smelt the hematite found on the Catoctin Mountains. Here, they created cannon balls and cannons that were used to win the war. A local ship graveyard, Mallows Bay is home to ships abandoned during World War II. There are more ships wrecked here than virtually anywhere in the Western Hemisphere, with at least 230 ships. They were part of a 1,000-ship order that was supposed to be completed in time to fight the Germans but never was. Poor workmanship and the end of the war led to their abandonment and you can still see some today. The famous author wrote mystery novels that intrigued the nation and still do. His death was equally as intriguing. He was originally buried in an unmarked grave and left there until funds were raised for a proper burial and headstone. After, another headstone was created and placed in Baltimore, leaving many to wonder where his true resting place is. If you are a fan of “The Great Gatsby,” visit the author’s gravesite, read the last line of his famous book and leave a pen or two. Perhaps F. Scott Fitzgerald is still inspiring books from the grave. View more Maryland Historical Sites.